One of the largest sections of my collection. 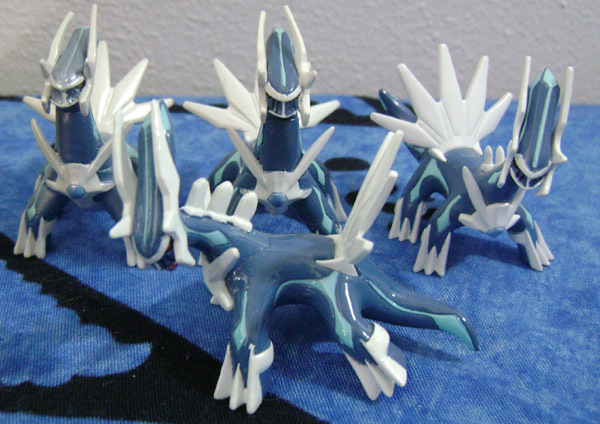 My goal is to obtain one of every Dialga figure ever made! Tomy Monster Collection (MC) Figures: From front to back, left to right. The breakdancing version of the Tomy figure. It's close in pose to the clipping figure, but otherwise pretty unique! 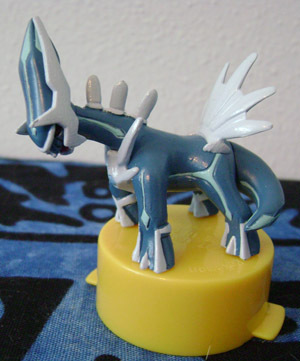 This figure is part of a set of 18 pearly-shiny figures that were sold together (and were fairly expensive). I bought the full set for Dialga (and Absol, and Suicune, and a few others) and have sold off most of the rest. I have another figure that has this same sort of paint and it's described as a "Shiny Color version" on the package, but I don't use that name for this because "Shiny" means something else to American Pokemon fans: alternate colors. 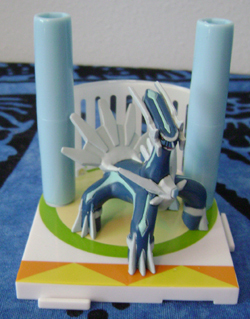 The standard Dialga Tomy, and a pretty neat figure anyway. 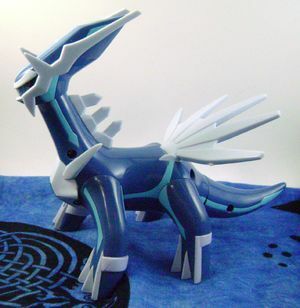 Every Dialga collector should own one of these. As is probably obvious from the source here, this is not a Japanese exclusive. 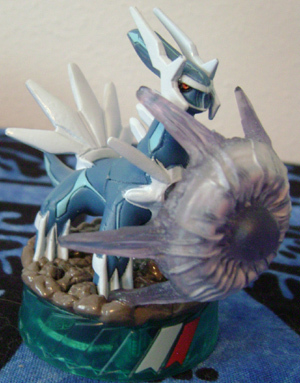 This is a release for the 12th movie, but in any case, I'm happy to see Dialga get another one of these cool figures. Dialga also got 2 Clear Tomy figures, and one Monster Collection Plus. 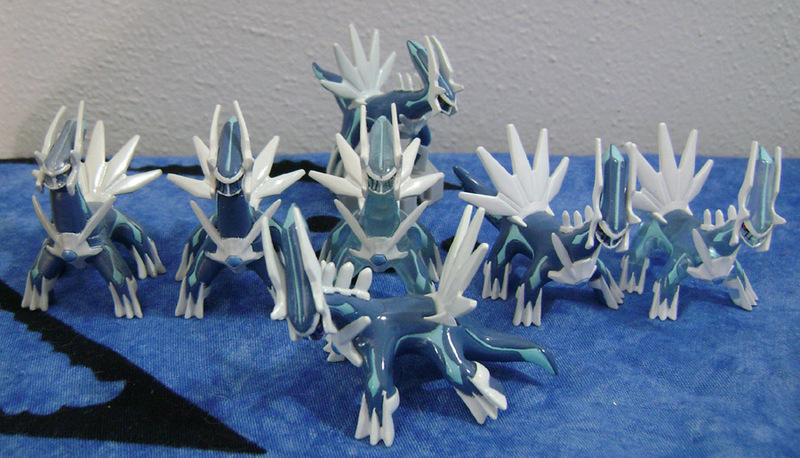 To see all of my Dialga Monster Collection figures together, click here. Now that there are two of these, they can have their own listing here! The standard pose one on the right is from the 10th movie (2007), and the new pose one on the left is from the 12th movie (2009). These are a series of more dynamically-posed Monster Collection figures with a chip in the base (for some game or other). 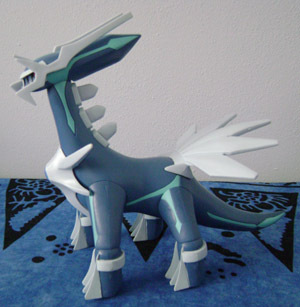 This Dialga figure is a 2013 release as part of the Hyper Size line, which features larger-than-normal posable figures. He's about the same size as the Pose Figure series, but much stockier. 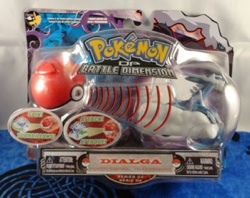 The tag on this one says "Large Soft Vinyl Figure", but since there are other figures that meet that same description, I'll use the pkmncollectors term of a "DX Tomy". 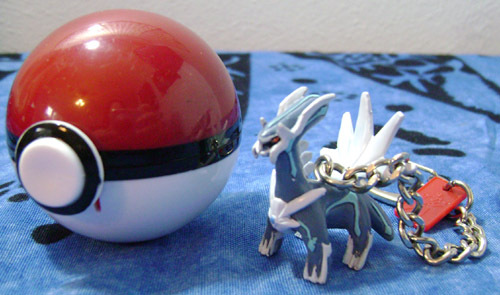 These are part of a line that also contains other legendary Pokemon, and some small cutesy Pokemon as well. 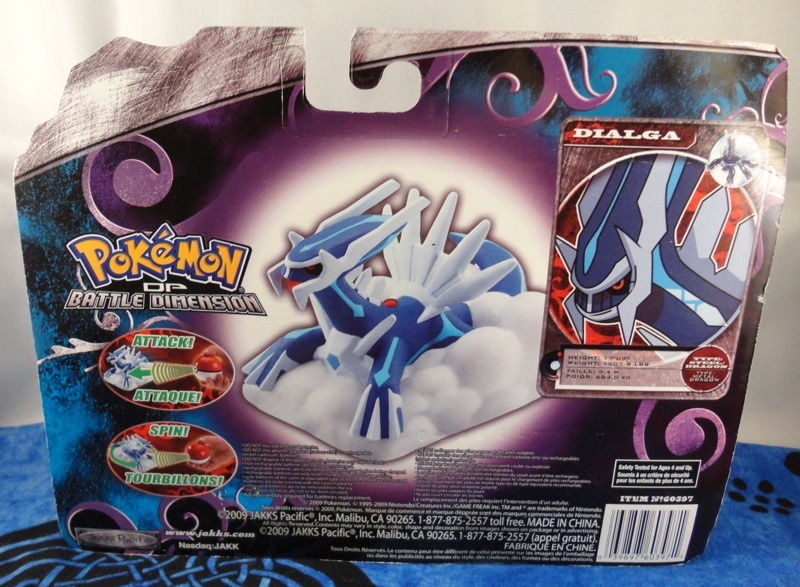 I didn't expect Dialga to ever get one, but he did as part of the 12th movie promotion, along with Palkia, Giratina, and Arceus. Yay! These come in both normal and Attack versions, but all are distributed either individually with candy or in boxed sets (also with candy). To my knowledge, I have all of the Dialga Kids variants ever released! I finally found the variant with the non-shiny paint! He's from an early DP set of 10 Kids packaged together. Can't tell the difference between this and the more common movie version? Here is a more close-up picture. I'm not actually sure where I got this one, but he's fairly common. As far as I can tell, he was only distributed through the Movie Kids pack (other than the method described below), and since there were no clears in that set, he doesn't have a clear Japanese variant. It seems odd to me that this figure would be reasonably common and only available through that set, but I checked the set lists for the early DP Kids and he's not there, so I guess that's how it is! Kids figures are also distributed in Europe and Australia, but sometimes they're slightly different from the Japanese versions. 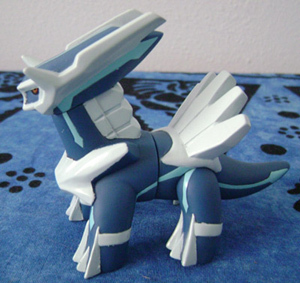 For Dialga, you can see that he has no paint at all on his back fins. I was actually hunting for this variant for a while when Riolulz threw it in as a freebie with something else I bought (which is elsewhere on this page). Thanks much! I had been searching for the clear of this figure for a long time, and had never once seen it on Yahoo Japan. (I later found out that's probably because a Japanese clear version doesn't exist, but hey.) Then Amara told me that it was a part of the packs they sell in Australia, and was kind enough to buy a set for me. YAY thank you! Bandai releases two packs of special 'movie edition' kids each year (or at least from 2007 on). 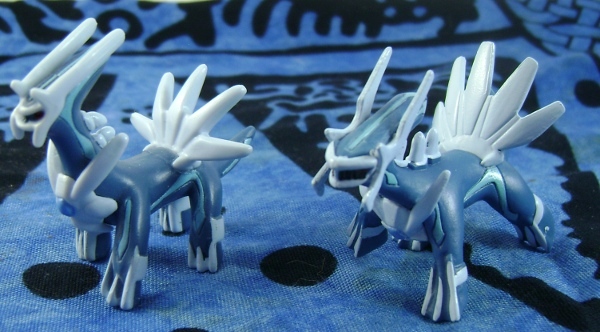 Callyfin bought a pack of the 2009 version, and we were excited to find that the Dialga kid included there had a different type of paint - shiny rather than the plain on his normal one! Dialga was lucky enough to get another Kids figure at the very end of the Diamond and Pearl era. I'm happy to have another different pose of his Kid! This pose does not have a clear or alternate version (yet). A Kids figure from the DX line. 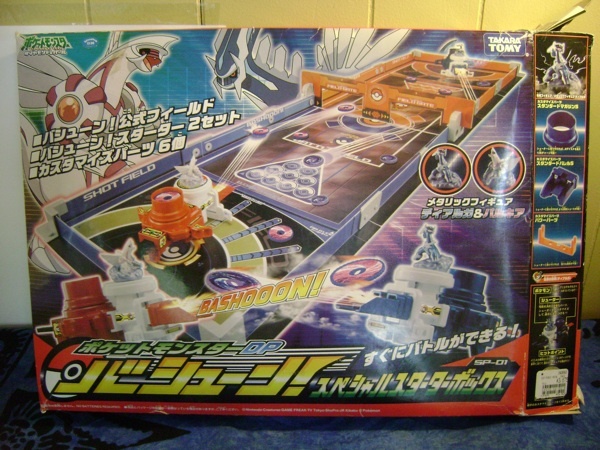 I bought this on eBay, then a few months later our nearest Mitsuwa got swamped with them. At least it had more time in my collection, I guess! 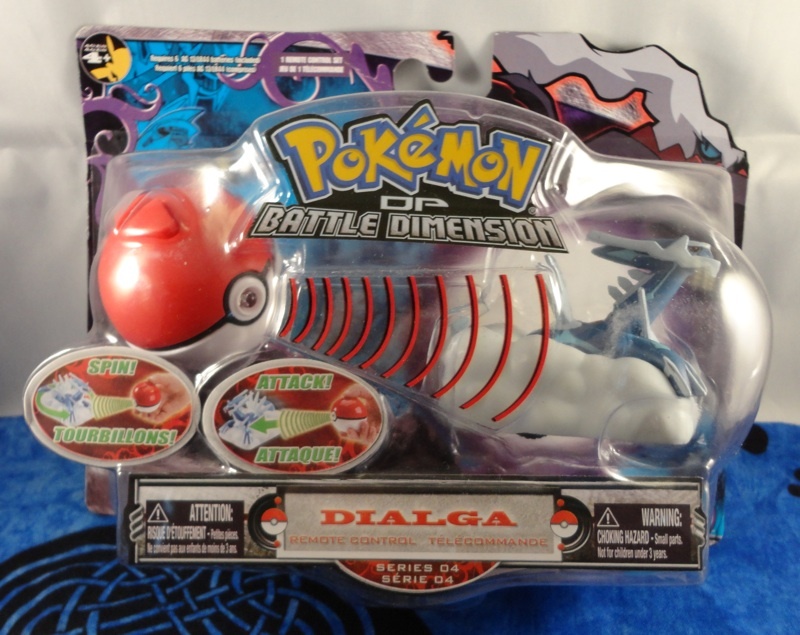 This was also re-released for the movie 12 promotion, in a set with Arceus, Palkia, and Giratina. 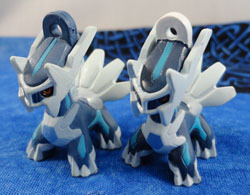 These are small figures on pegs that connect to bases, and the bases link together, although Dialga is too big for his to really do that. 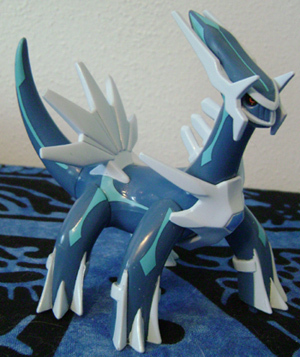 Dialga has done pretty well in this series so far, with a good seven figures and three alternate ones to date. I think his movie promotion is about done, but he may continue to get some more of these here and there due to his status as a legendary and signature Pokemon for Diamond. Although the figure style is the same as one of the Chou Get! from an older series, the figures for the 11th movie set all also had clear versions as well. I got the clear one on the right direct from a gashapon machine in Akihabara, and it was the last toy in the machine, too! 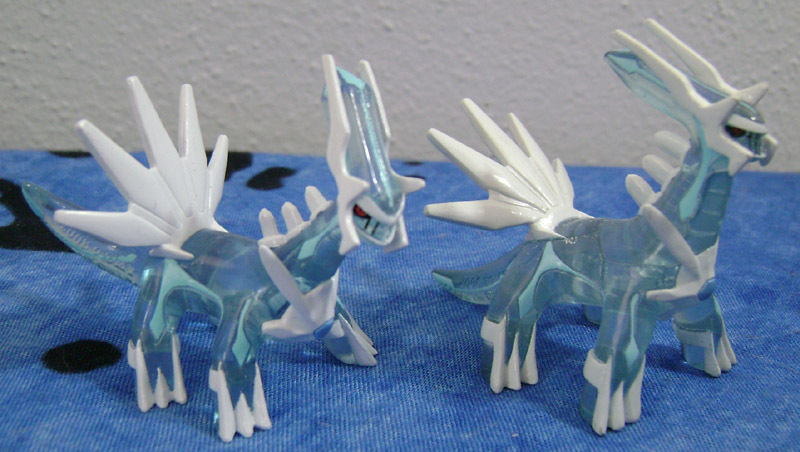 The Platinum one I got as part of a group buy of sorts from Callyfin, and the clear on the left is part of a set featuring many movie star Pokemon in clear (DP National Dex 9). There is actually another clear version that I don't have. 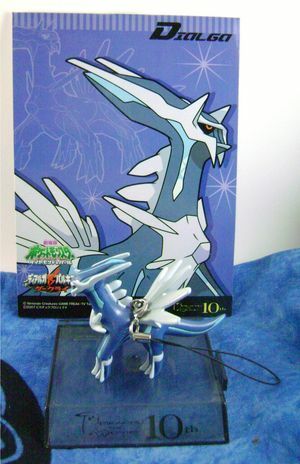 For some of the 2007 DP sets, there was a promotion going on where you could send in 5 of the inserts for a chance to win a sterling silver Dialga figure. 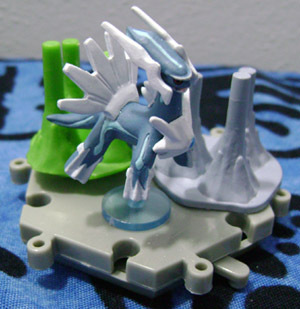 (The promotion also included Palkia, and I think you chose which one you were trying for when you sent in your inserts.) For those who entered and didn't win, there was a "second chance" drawing with 50 prizes a month, 500 winners total. 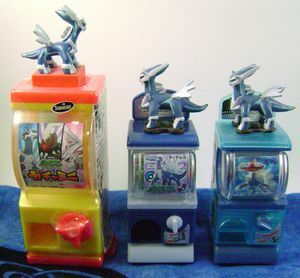 There were two possibilities for prizes (you didn't get to choose), and they were clear Dialga and Palkia figures, along with 200 (Chou Get?) bases. Thankfully, I already have the silver prize figure, as I bought it on Yahoo Japan a month or two into Dialga collecting when there were several listed. I haven't seen one since then, and it's been over 2 years. But, I don't have that clear Chou Get, which is the 'default' pose (the same as DP1 up above). I'm looking for it and would pay quite well if I could find one! 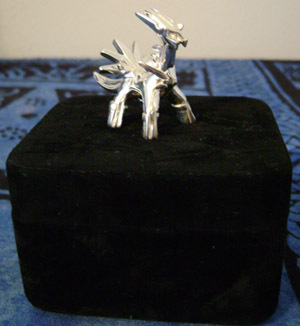 This Dialga is a small sterling silver figure - the bottom of one of the feet is marked ".925". It comes with a velvet case and a small polish cloth, in addition to the "Not For Sale" original box. If it wasn't for sale (in stores), where did it come from? 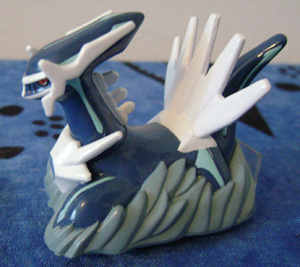 Per the Chou Get description above, you had to send in 200 inserts and a clear Dialga Chou (which I guess was randomly inserted in capsules) to get this in 2007. Now that a few years have passed, I'm sure glad I bought it when it was more commonly up for auction! Very tiny but awesome figures. 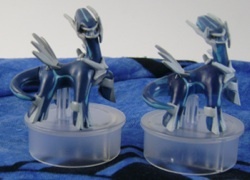 I bought the first two of these from Sunyshore quite a while ago and still haven't seen them for sale anywhere else. The third one was much anticipated and quickly bought on Sunyshore as well, and the fourth one I picked up from her in Japan! The fifth one (which looks like a reverse of the third one) is from a limited edition set that was released in January 2010. 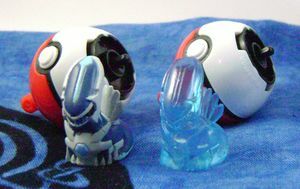 This set came in 3-packs (instead of single balls like regular Keshipoke) and the same three figures were in each set. 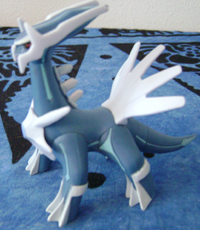 Dialga was part of a set with Lugia and Giratina, and mine arrived after being pre-ordered for quite a while! I've had the clear quite a while since I found it on Yahoo! Japan, but I could not find the original one for sale anywhere. It didn't show up in the Dialga listings, nor could I find it in figure lots or on pkmncollectors. Finally, the seller on Amazon.com who had the Chara Dash figures (below) had a single sealed Chupa Chup from this series, and I bought it on the off chance (well, about 1 in 12) that it would be Dialga. I got lucky. The 12th movie version, shown on the right, I got as one of only 3 I bought in Pokemon Center Tokyo in July 2009. As usual, it's much easier to get the newer items than the old ones.. I had the gold figure listed on this site for some time, but with the release of the 11th Pokemon movie in Japan, they released the figure in 3 new colors! They were sold in randomly packaged Pokeballs, with the Dialga and Shaymin (both formes) as the prizes. 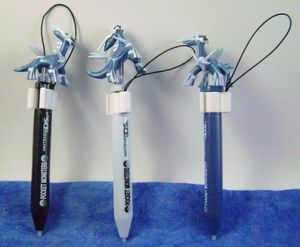 The full color one is the top prize, followed by the silver and bronze - the gold wasn't included in this promotion, but was a second place prize from the one for the 10th movie promotion. The booby prizes were round and heavy Pikachu, Shaymin and starters figures. I didn't luck out with the randomness in Japan, so I ended up buying all of these guys on YJ. 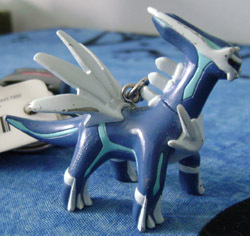 Even though it's the same color as the rest of my collection, I like the Dialga-colored one best. The two in the back are clear versions of the 10th and 12th movie editions, which were parts of the same sets. The other two sets didn't feature clears. 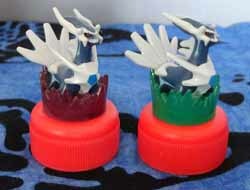 The Hotto Motto series that was released in 2008 for the 11th (Giratina) movie was a set of stamps, so that's what I expected from the 2009 series as well. 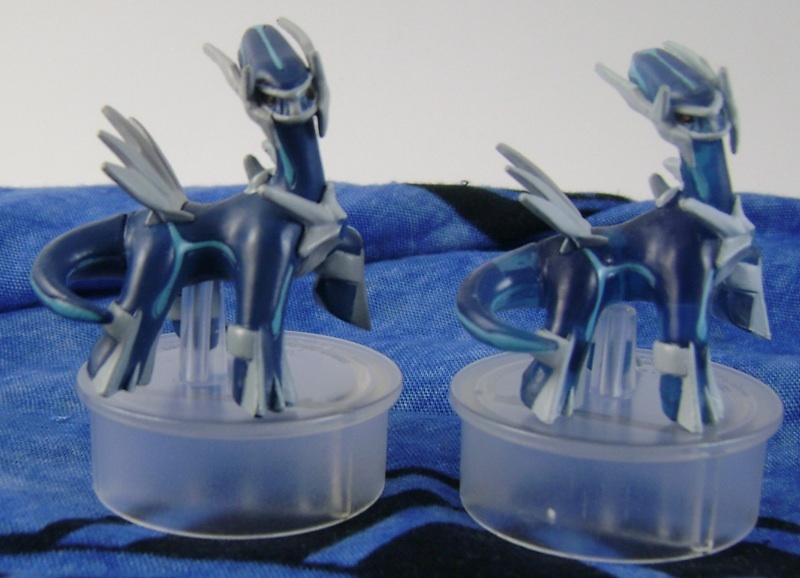 However, they're actually wind-up figures this time! 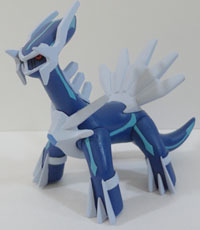 This is part of a series Banpresto released for the Arceus movie promotion. There are several different sets featuring Pokemon like the Johto starters, Arceus, Gizamimi Pichu, Heatran, and others, and Dialga got included too! This is a slightly chibi-fied figure about 1" tall. I love it! 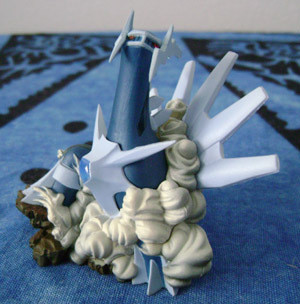 The first one is a very cool posed figure, so I was pretty excited when Dialga had a second clipping figure announced in Series 6! I actually ran a small group buy for the full set to get him, and was not disappointed when he arrived. I think these are really beautiful figures. 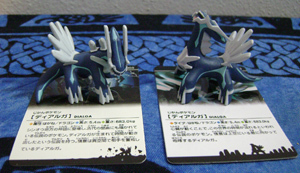 In this series, each figure comes with its own card. This is part of a series featuring a little built in roulette, which you can trigger by pressing the button in front. What a cute set! 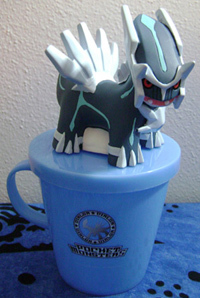 I was pleased to find that the chibi figure on top of this cup comes off very easily, so that I can include it in my figure collection shots. This is a fairly large cup: with the figure, it's about 8" tall. An odd little figure that you can charge up and shoot off. This is part of the 2007 movie promotion, but I just saw this one for the first time (and bought him, of course). 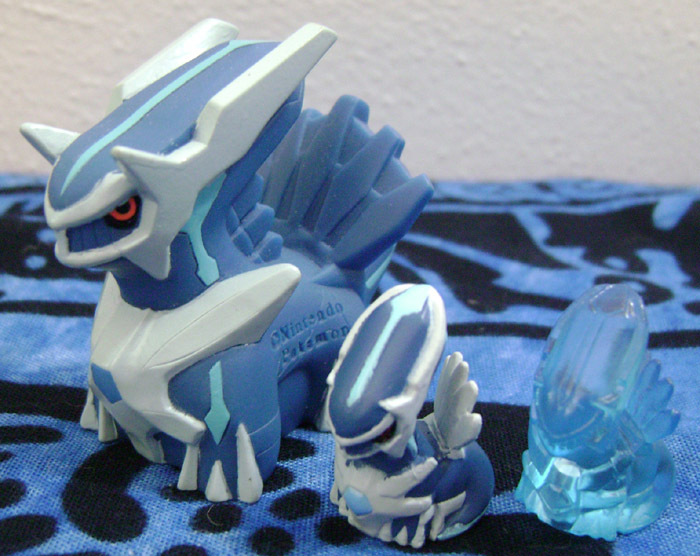 This is part of a gachapon set featuring the Reverse World from Giratina and the Icy Sky Bouquet. 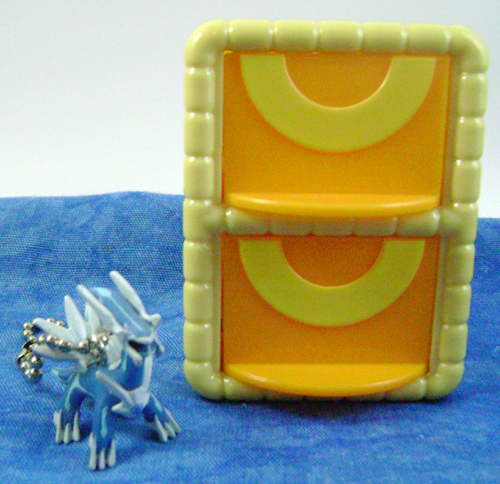 The other half of the set has Giratina, so that's why this side looks a little odd by itself. The Card Battle Stadium series only went for a short while before they switched to Super Card Battle Stadium, and both sets have Dialga. 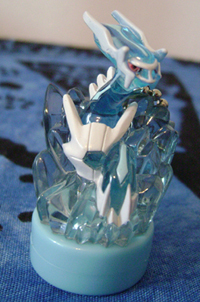 This clear version is a special promotional figure, and the non-clear was only available with the full Card Battle set (just like the Super version below). Another set where I had the clear for a long time but couldn't find the original, and now I finally have both! 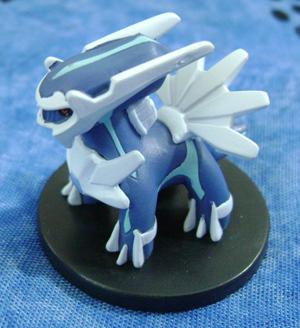 This figure is part of a number of (mostly legendary) Pokemon in a battle set. Many can be purchased individually, but Dialga is one of the ones that comes only as part of a large set. 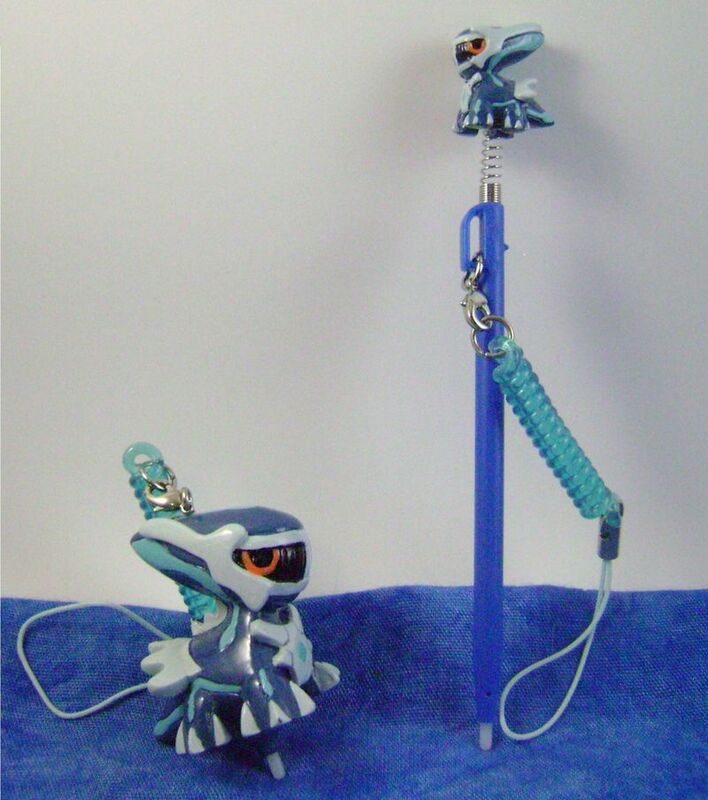 Not just two different-colored Pokedoll pens, but one is a mechanical pencil. Nifty! 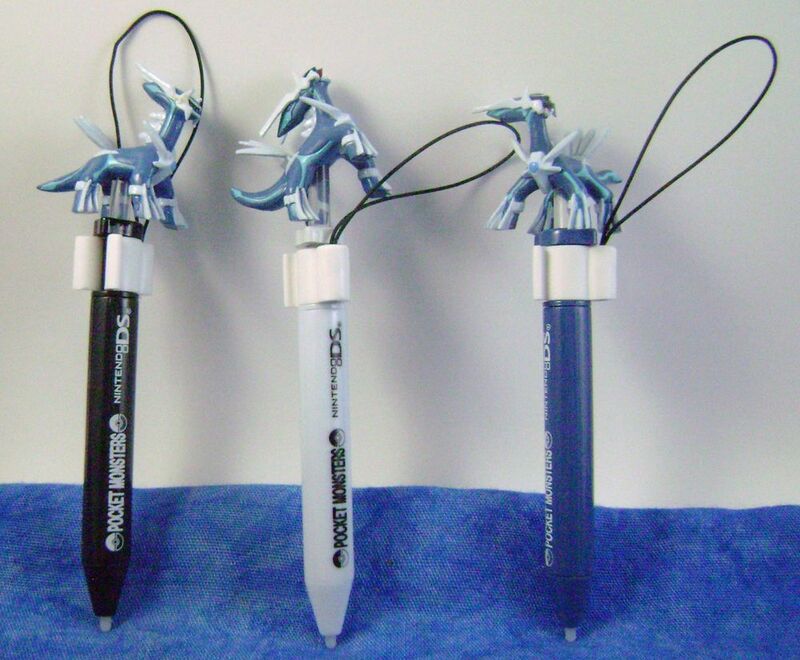 3 different figures atop styluses. The second one broke so that the figure can sit just on the little stand, and I have to admit that it's tempting to break the others too so that they display better ^_^; Styluses are hard to display properly! Two different versions of a Pokedoll-like figure atop a stylus. I'm still not 100% convinced that these are legit, but hey. 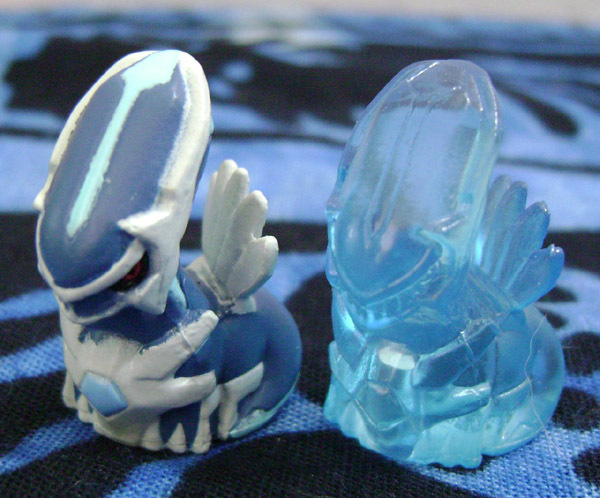 These very tiny figures are part of the Bashuun game. (I think it's a sound effect?) The regular version I picked up in Toys R Us on my first visit to Japan in 2008, but the metallic version escaped my notice for a few years. 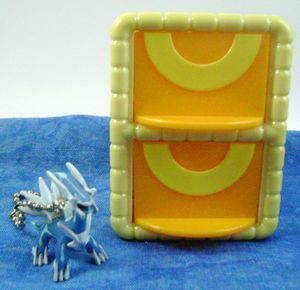 I eventually discovered it in a large playset, and picked it up! Each also comes with cards, discs, and a launcher, not shown here. The Choro Q are a set of nicely made pull-back cars from Takara Tomy. 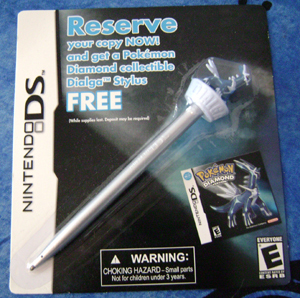 This one suddenly appeared in a Toys R Us, a few weeks before its actual scheduled release date of July 31st, 2008. Lucky me! Here's a picture of one still in the box. This Choro-Q (much smaller than the other one) is part of the summer promotion for the 11th Pokemon movie. I received it as a bonus for buying a set of lemon-flavored drinks! These are the follow-ups to the 2008 Mini-Choro Qs, but these don't have the same type of base. (I'm not sure if they're made by Choro Q or not, I think they're not?) 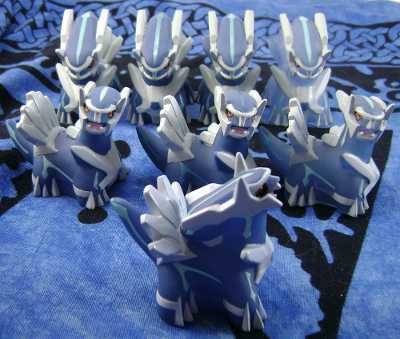 Anyway, on these, the figures all move, and on Dialga's, his tail moves up and down. 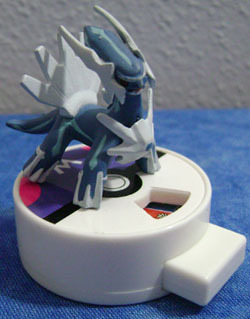 Like the previous year, these come attached to drinks that you have to buy to get the figure. 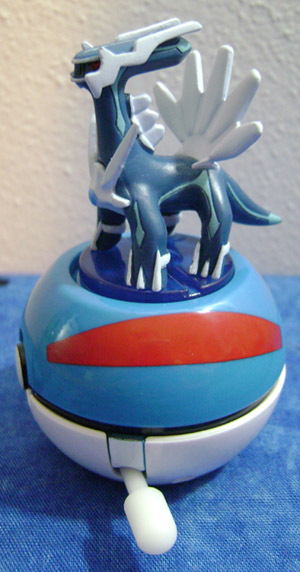 I only discovered that this figure existed after finding an old post on All About Pokemon Figure. 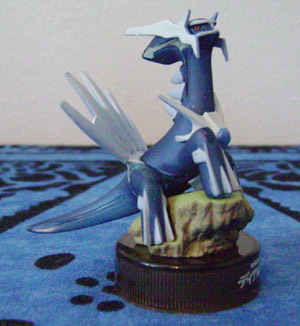 I had the Lucario from this series and thought it was a really cool figure), and was excited to find that a Dialga had been made about a year and a half before. 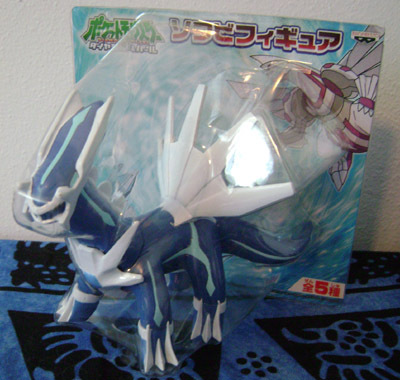 But that had never turned up in my months of Dialga-searching, so I thought I might never find it...until it arrived in a random lot of figures I bought on Yahoo! Japan! I thought the figure itself was going to be the same as others I have, but surprise, it's of a different type of material, which I was pleased to see. That one did have a bit of wear to it, though, so I've since replaced that one with another in better condition, found on YJ. You can see the old photo of the pair of them here. I found this on Yahoo! Japan and was surprised to see that it had screw holes. 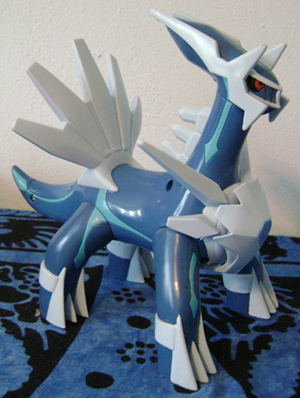 I'd never seen a Dialga like that, which meant I didn't have this one! If you push on the tail, it moves the head and the back fin and the chest lights up, so I think if you put fresh batteries in you can make it move (mostly) on its own. 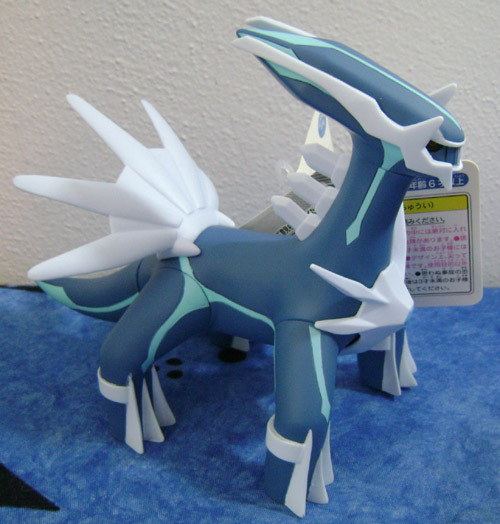 I believe this is the Japanese version of the light up figure sold in the US, although that one doesn't have screw holes and is smaller. 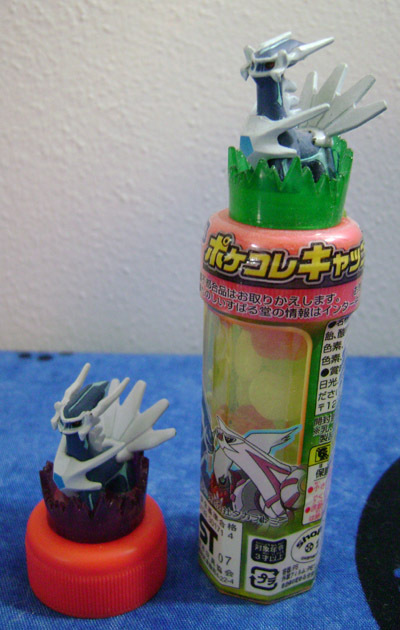 The larger one on the left contains tiny capsule-shaped candies instead of miniature capsules that can be opened. The other two are gachapon prizes themselves, and must be assembled (including applying all of the stickers). The figure inside of here is a lot bigger (and cooler looking) than I expected. However, it still refuses to face the camera properly. Another set celebrating the Pokemon 10th anniversary. 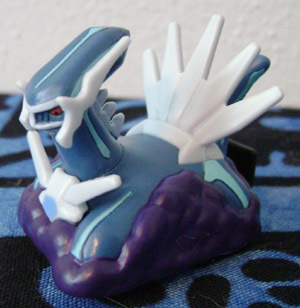 This is one of the few Dialga figures showing the Pokemon in its natural habitat. 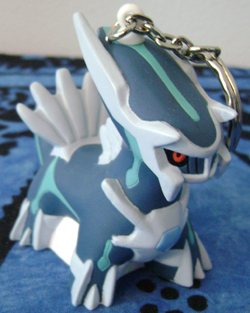 Also, one of my first pkmncollectors purchases! 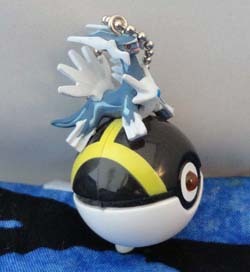 This is part of a gashapon set featuring the Pokemon that starred in the movies. It comes with a stand and a to-scale Ash figure. Some people consider these not really Zukan because they're to scale with Ash rather than other Pokemon. I took the Ash out because I'd prefer to just have the Pony ^_^ I had been looking for this figure for a long time when resilientspider kindly offered to trade me one. Thank you! 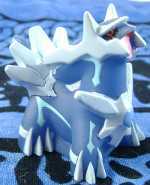 This big hollow figure is part of a set with Palkia (and maybe others). It came unassembled and was really hard to put together, so much so that I accidently cracked the tops of the legs trying to fit them into the torso. 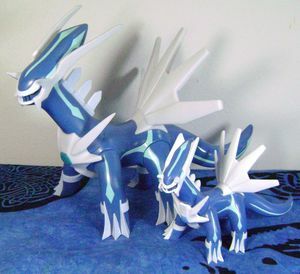 Sorry Dialga! 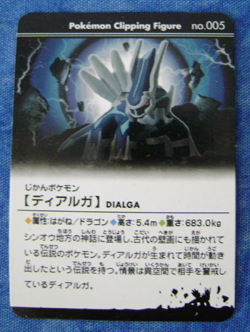 I hope I made it up to you when I took you in for my Japanese presentation of "Dialga is rampaging the city"! The smaller one is quite similar, but is already assembled, and can be seen in its package here. It's from a set released in summer of 2008. I had the two figures above for a few years before I saw a shiny metallic Palkia in a pkmncollectors post. 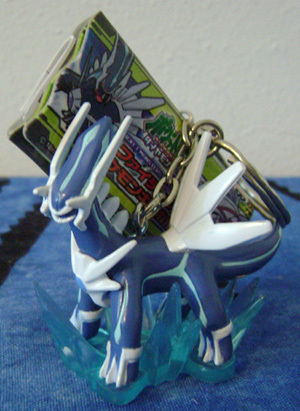 I thought there was probably a Dialga in the set, and sure enough there was! I'd probably seen him many times on eBay and Yahoo! Japan, but without knowing that there were variations, I must have assumed it was the one I already had. As with some other Banpresto UFO items, this figure is referred to as "shiny color", but mean something different than the alternate colorations most English-speaking fans associate with the term 'shiny'. 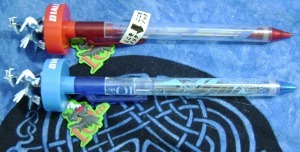 For quite a while, I had one of the series 1 caps without the candy tube, and one of the series 2 caps with a sealed candy tube, as you can see in my old photo here. It bugged me a little to have one loose and one open (especially since it makes their sizes and shapes so different), so when I saw a sealed series 1 set on eBay, I had to go for it. It turned out that the seller had a wrong photo and actually only had series 2 - but it all worked out, because now that I have duplicates of the series 2 figure, I don't mind opening one of them to have a matching set! Series information thanks to Setazero's blog. If you have a sealed figure, it's pretty easy to tell which set it is from the packaging. It's surprising that the addition of a little base can make this figure so different and so cool. It became an immediate must-have as soon as I saw it. This one I had for quite a while before adding it to my site, oops! What probably happened is that I took a bad photo, didn't add it, and then forgot to retake it. 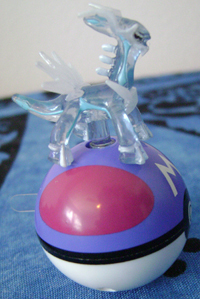 Anyway, this is a McDonald's toy from a DP series featuring Pokeballs that did various things, such as stamps, light up toys, etc. This one has a button you can press to light up the Dialga inside! Part of a set of light up keychains, but this time he is sprawled strangely over an Ultra Ball instead of standing up. 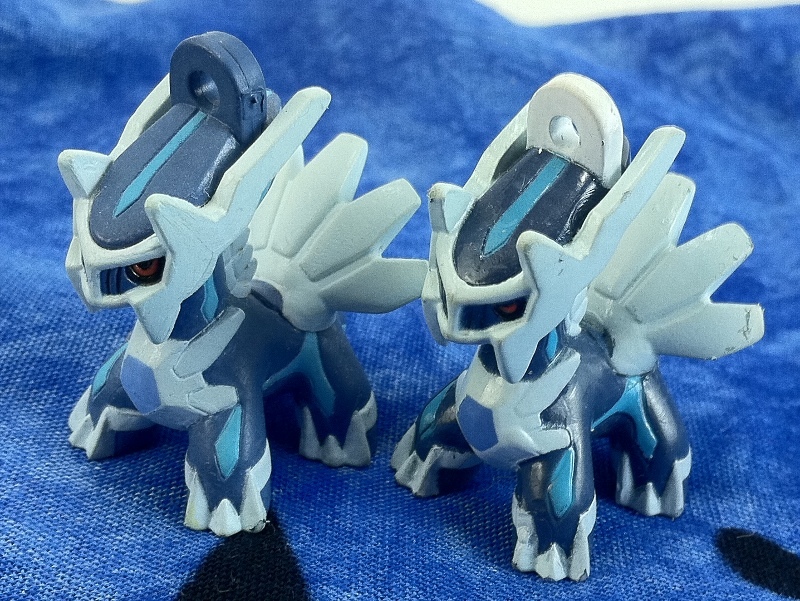 This is from a set of 11th movie figures that look like plush, but aren't styled after the Pokedolls. How original! 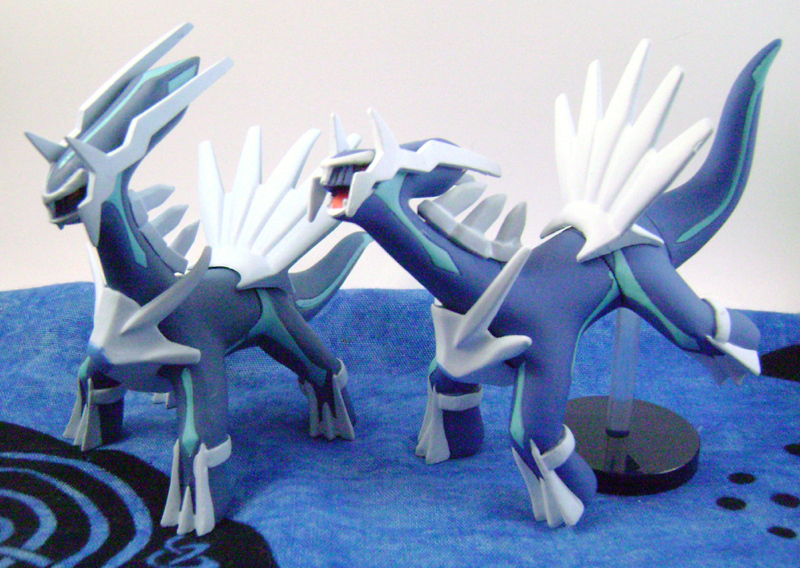 It looks like Dialga got (at least) 3 figures in this series, all a bit different! 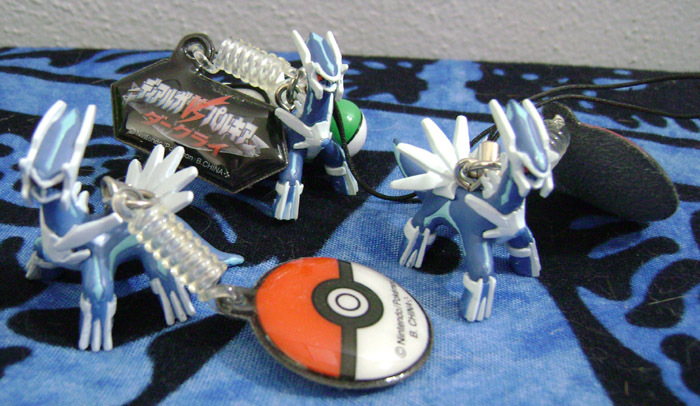 The one on the right (from eBay) has a heavy keyring, while the other two have small thin keychains. All 3 Pokedexes are a bit different. 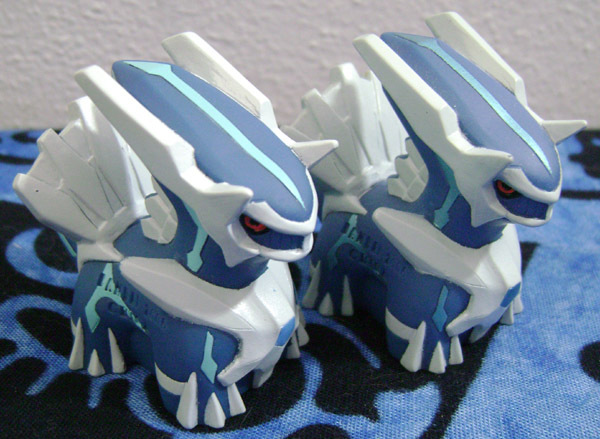 I've seen the other two quite a bit, but the one with the blue keychain only turned up after nearly 2 years of searching (for Dialga, not that keychain). I wonder if that set is rare? I bought the Wizzywig and Sunyshore versions at about the same time (I forget which was from where), and thought I'd bought a duplicate, but when they both arrived, they turned out to be different! The one in the middle is a new addition discovered on Yahoo! Japan. It must be a pretty rare gachapon set if I'd not seen it until then (and neither had my friend Irene, with her very extensive Darkrai collection)! I'm selling the rest of the set here. This is a slightly squishy little figure about the size of a Kids figure. I have no idea why it's called a 'scooping' figure, but that's what the auction called it! 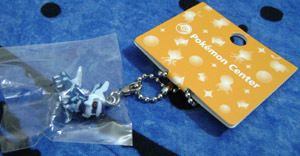 I actually bought a lot of 50 of these on Yahoo Japan! in fall 2008, but somehow he missed getting added to the site for a long time. Sorry little guy! This tiny figure comes attached to a plastic miniature drawer set for poffins. I just like it as a small figure, though. Thanks warandromance for the trade! 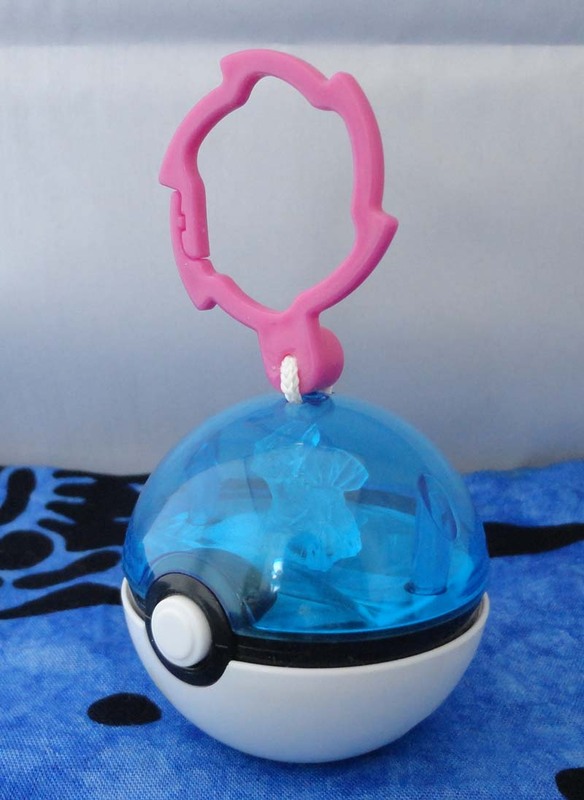 This big keychain is rubbery and hallow, and all over Yahoo Japan. It's a little stubby, but not quite enough to be the coveted Pokedoll form. 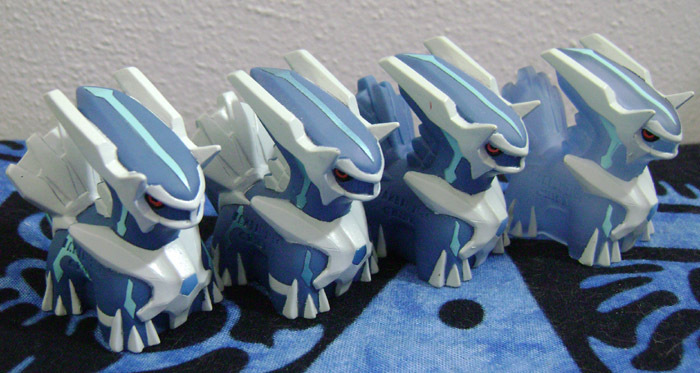 From left to right, we've got: European version (different mold from the others), American version (no tag), another European version (tag says Pokemon), and two Japanese versions (with Dialga's name on the tag and 2 different colored straps). 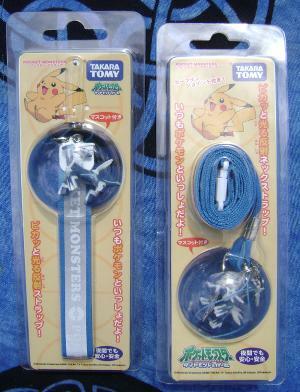 A short wrist strap and a long lanyard featuring the same figure. This set is from the same series as the above, but with a happier figure. 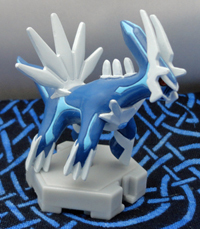 I believe this is from the Arceus movie wave of goods. 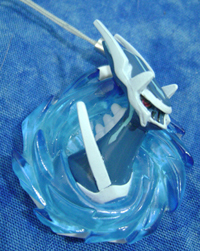 I found the wrist strap while searching through Dialga auctions on Bidders, and recognized the picture as being from Strapya, which also has their own website which you can buy from directly even if you're not in Japan. I searched their site for Dialga, but found only the straps I'd already bought from them before. Thinking that they must have it, I searched for 'Diamond and Pearl', and found it, but listed as "Diarga". Ha! The longer one I was surprised to find in the Pokemon Center, as I didn't realize they'd released it in both short and long strap versions like the other one. Here's a close up of just the figure. For this one, I didn't want to take it out because it's hard to put that long lanyard back in the packaging! 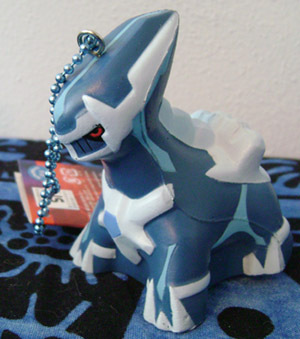 This figure seems to have the same mold as the DP Keychain UFO prizes. 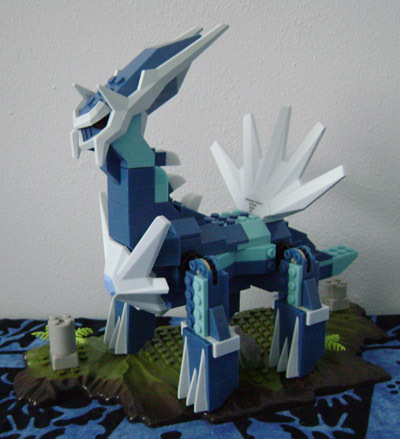 It's part of a set with many other Pokemon featured in the movies. At about the size and weight of a Tomy figure, I think it's way too big to actually put on a phone, though. I guess they must have released a lot of these sets, because Dialga has at least 6 different versions of these now! The one on the far right is a pearly shine version that was released for an 11th Movie set. 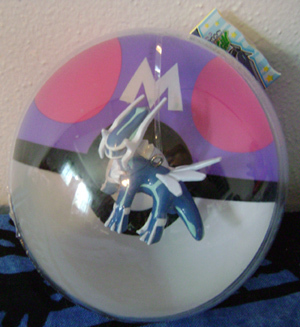 So var, the variants I have are: 1) where the keychain has a flat Master Ball with a spot to write a name on the back, 2) the same, except a Poke Ball instead of a Master Ball and there is also a purple piece on the keychain, 3) where the keychain has a 3D Master Ball, 4) two where the keychain has no attachments other than the figure (with different finishes on the figure and different card backings), and 5) the pearly shine variant. The one that looks really beat up is this one, which I used to use every day on my actual keys. I'm more picky about getting all the alternate versions of items for Dialga now than I was at the start of my collection! 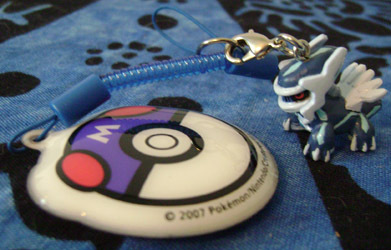 Comes with a small tag you can pull out to activate the light-up action! I've left it in for now, though. 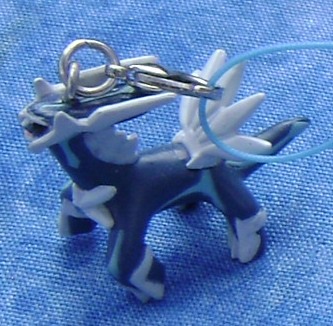 This little Dialga was part of a trade, and is one of very few Dialga chibi-style items I've managed to find so far. How stubby! 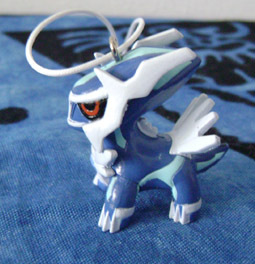 This is the same figure as the strap above, on a different type of keychain. 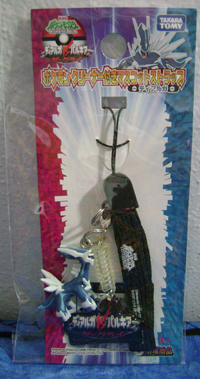 I think this may be part of the 2007 movie theater goods, but I'm not sure! I'm not sure whether to count this as a figure or not. It has a head just like a figure, but it doesn't stand up on its own. Anyway, it's a cool strap! A super cute squeezy toy! 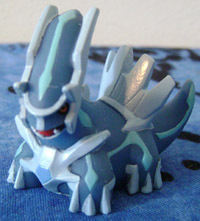 These appeared to be left over from the 10th movie promotion from the previous year, so I was really lucky to find him! 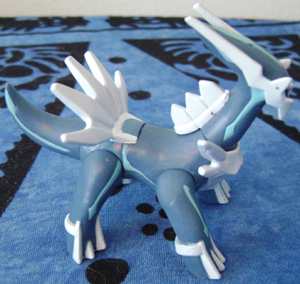 I didn't realize when I bought this that it's only half a Dialga - the back half is completely missing from this figure. Let's just say he's emerging majestically from the smoke. Part of a randomly boxed set - I didn't want to take my chances getting the wrong one on Wizzywig, so I just bought it directly off YJ. 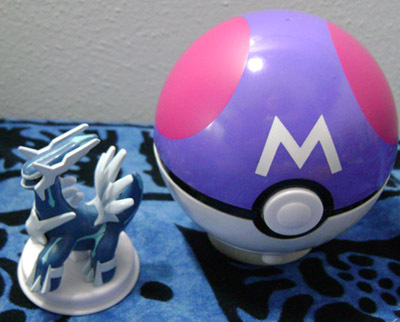 Lights up when you press the Master Ball's button. One of the big kits that come with a few small Mega Blocks. This was a lot of fun to put together, but it doesn't stand on its base very well. There is an individual block as well, which I've also obtained! It can be found in the Other section. Another set I bought on eBay only to find at Mitsuwa later. This is tricky to assemble because of the stickers (and because the legs all look almost the same) but it was fun too. Here is a closeup of the figure on the end. 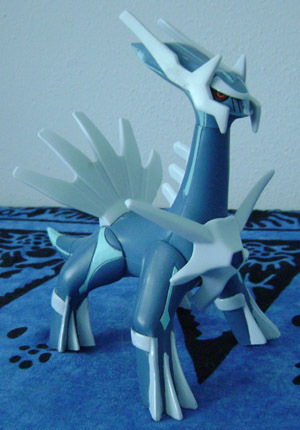 This is from a series of posable figures that came out in early 2008. It's also really easy to mistake other figures for this one, it's pretty standard looking. 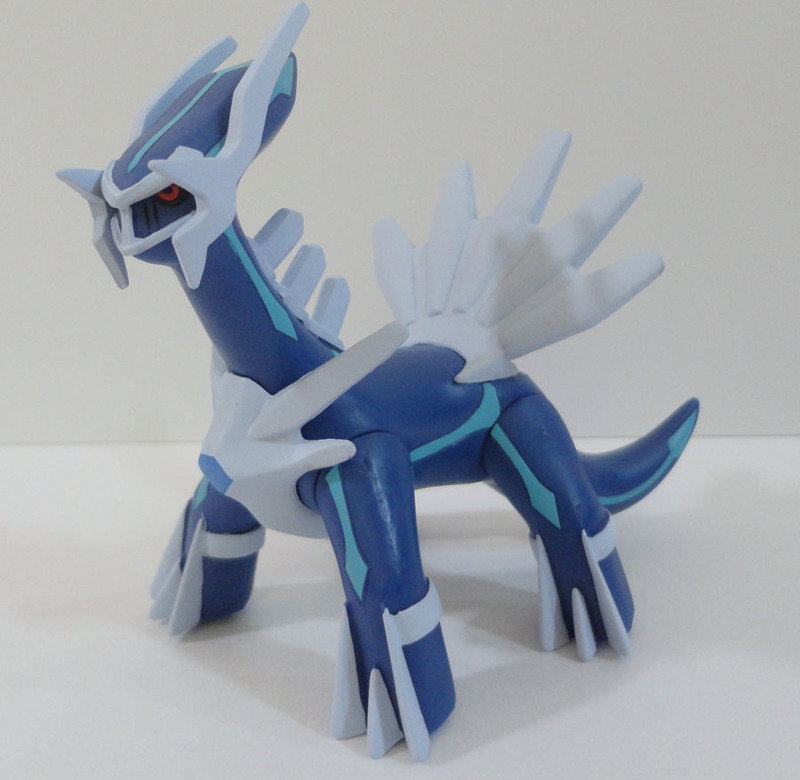 Dialga had a zukan released in set DP4, and it was a standing serious Dialga like many others here. 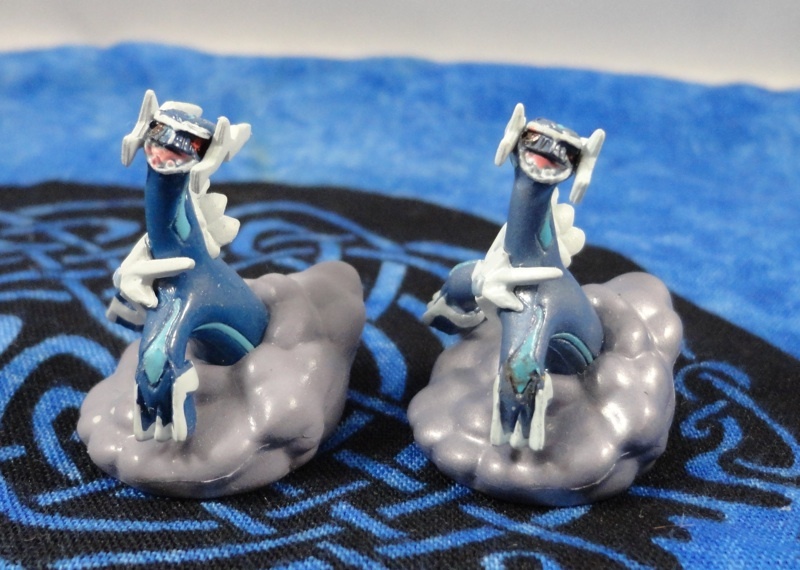 Then another was released two sets later in DP6, showing how happy Dialga can be! Zoom zoom! This racing and spinning figure comes with a Pokeball remote. It makes funny space noises when you push the buttons. I haven't made it "fight" with Palkia because I don't want them to dent each other up, though. These two styluses are almost the same, but one is from the 10th movie and one from the 11th, and you can see their logos on the side of the stylus. 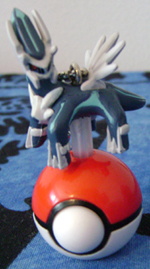 I think these are pretty poorly designed - Dialga is attached to the cap, so if you take the cap off to use the stylus you also take off Dialga, and the cap doesn't clip on to the back of the stylus because there's a Master Ball there. I bought two of them anyway! I kept looking for this figure in lots, but eventually just gave up and had to buy it singly. (Probably for the best that I did, because I see it pop up loose fairly often, but not with its base!) 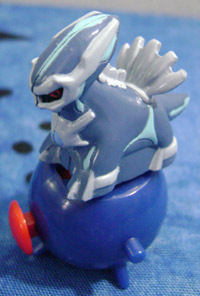 It's meant to be clipped to other figures in the series using the links at the sides like the Chou Get! series. Ah, Jakks Remote Control figure, why did you take me two years to find? To date, I have only seen two of this figure, both on eBay, and the first one sold out before I could get to it. Due to his rarity I haven't removed him from the package yet - if/when I do, I'll update the photo, but for now you can see the figure in more detail on the back of the package here. 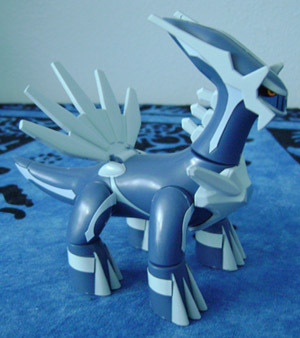 In the course of searching for this figure, I ran into all of the other wheeled Dialga figures many times. You can see a comparison photo of most of them here. 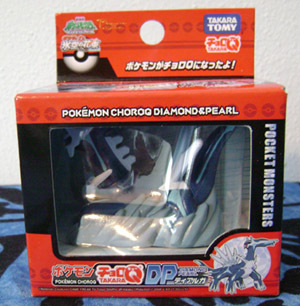 I'd seen this series around quite a bit, and even have the Poochyena figure from the set on my keychain, but I just recently became aware that there was a series with Dialga, Palkia, Darkrai, and Lickilicky. 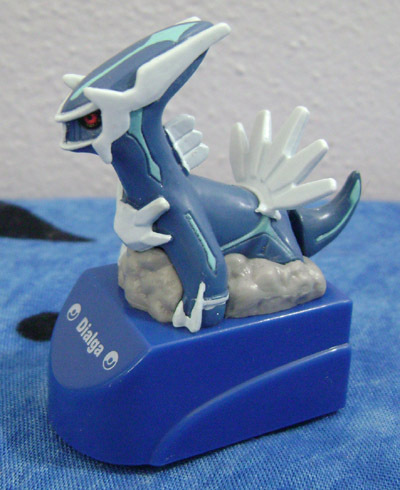 I had to have the Dialga! 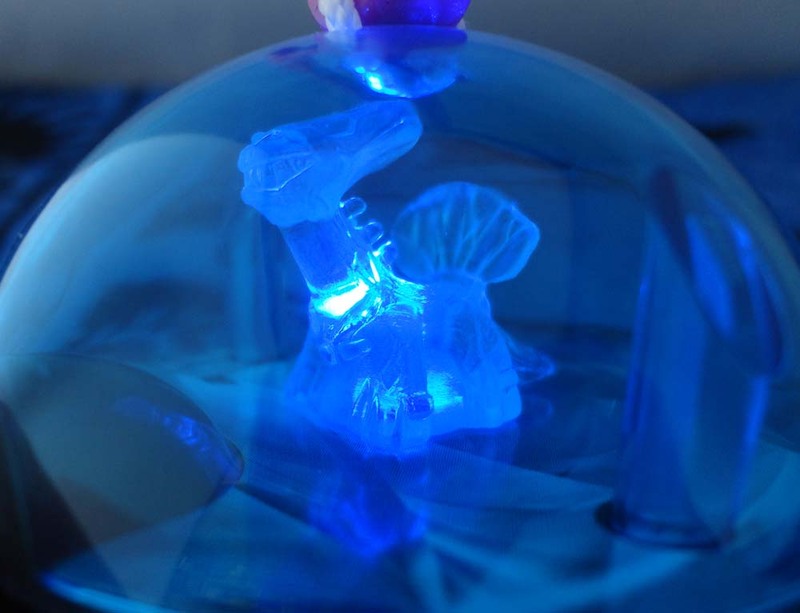 A fairly large figure, that lights up when you press the gem on its chest. This is different from the Japanese version! One of those basic Dialga figures. I arranged for my sister to get me one when they showed in stores where she lives since I'd yet to see any. Luckily I got one with a good paint job, or maybe she picked it out that way. Thanks Lauren! 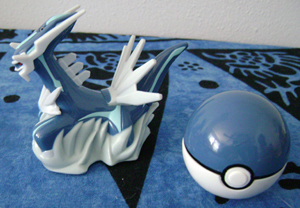 I bet almost every Dialga collector has this one. 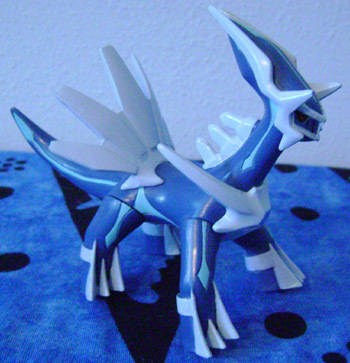 These were given out with the Diamond pre-orders back before the games were released, so it was one of my first Dialga items ever (well, my very first if you don't count Diamond as a Dialga item). This figure is marked as a Toys R Us exclusive. Anyway, it's a nice big heavy figure! 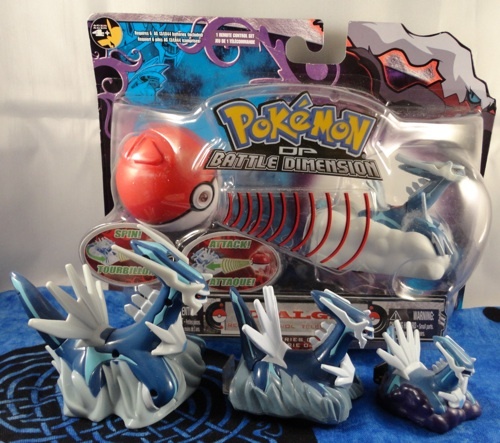 I actually thought about getting the Palkia in this set too, but the Dialga objected. 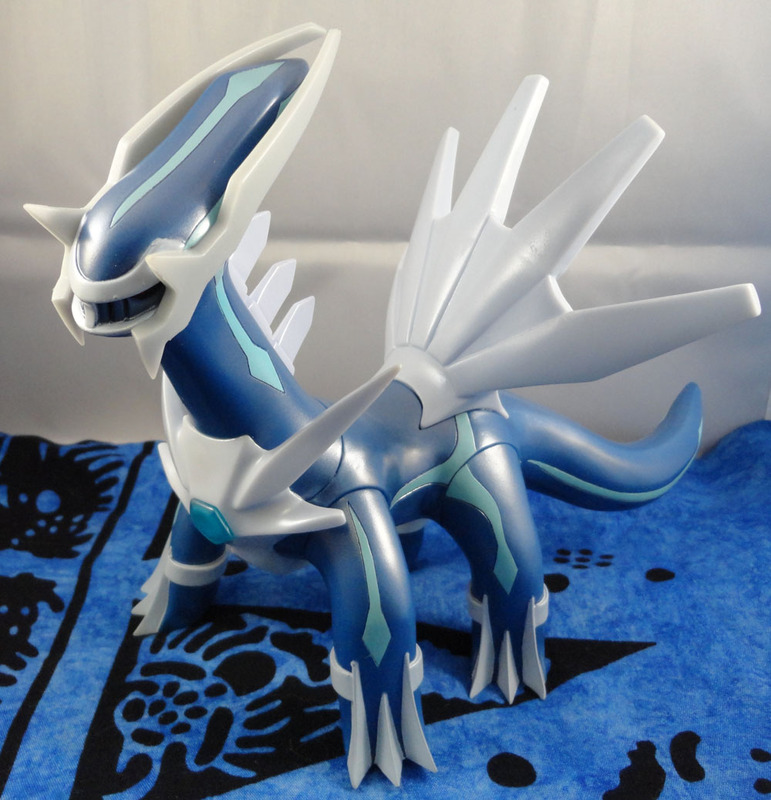 I thought I had nearly all of Dialga's figures when this clear figure appeared on pkmncollectors, and on hold for me no less! I bought it immediately, but he said that there was also a non-clear version that the gachapon machine in Italy didn't have. With his help (and scanned insert) I found out that they were actually made in France but sold in gachapon machines in Italy (and possibly other countries), and managed to find a full set on eBay.it to score the non-clear. Works for me! You can see them without the Pokeball parts here, and next to a Kids figure for size comparison here. These are from a Europe-exclusive candy and figure set, and would have been very hard for me to obtain if not for pkmncollectors! 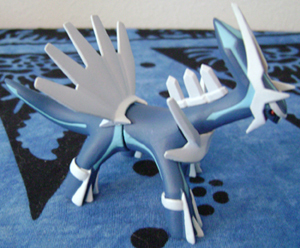 A nifty posable Dialga, also exclusive to Europe. This looks quite similar to the Japanese figure styluses, but says Pokemon in English instead of Japanese!